Glorious view from the beach to the Royal Thai on the private island - Volleyball anyone? 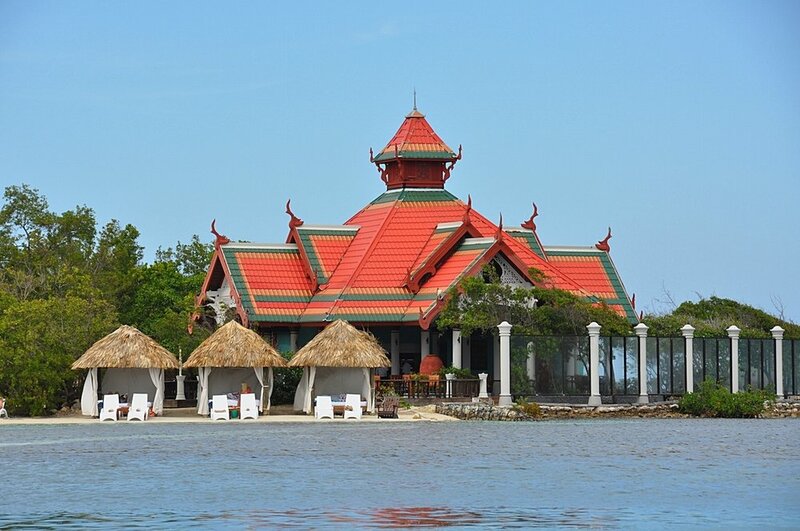 Royal Thai Restaurant on the Private Island open for dinner only. Beach beds are free on a first come basis. Heading to Sandals Royal Caribbean? Imagine landing at Sangster International Airport in Montego Bay knowing that your trip to paradise is a mere 10 minutes away. It doesn’t get much better than that. Well, so you might think until you realize that it is also home to Jamaica’s only resort with a private offshore island, one of a kind over-the-water private island butler villas with infinity pools and over-the-water private island butler honeymoon bungalows. And that is not all either. Perhaps the magnificent crystal lagoon swim- suites, or 20 5-Star Gourmet dining options (8 at Sandals Royal Caribbean, 9 at Sandals Montego Bay and 3 at Sandals Inn), or the authentic Thai restaurant over on the private island will have you saying enough. There is more but not enough space to write about it all. Let’s just give the simple facts. The newly renovated Sandals Royal Caribbean is an elegant and sophisticated showstopper that has a British flair. Don't be surprised to see roaming peacocks and afternoon high tea every day at 4:00. 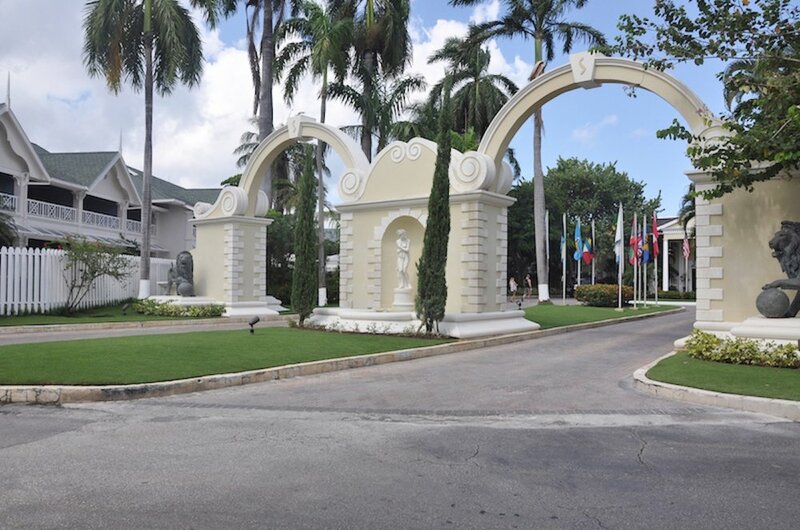 Sandals Royal Caribbean is on 15 acres of the northern shores of Jamaica. 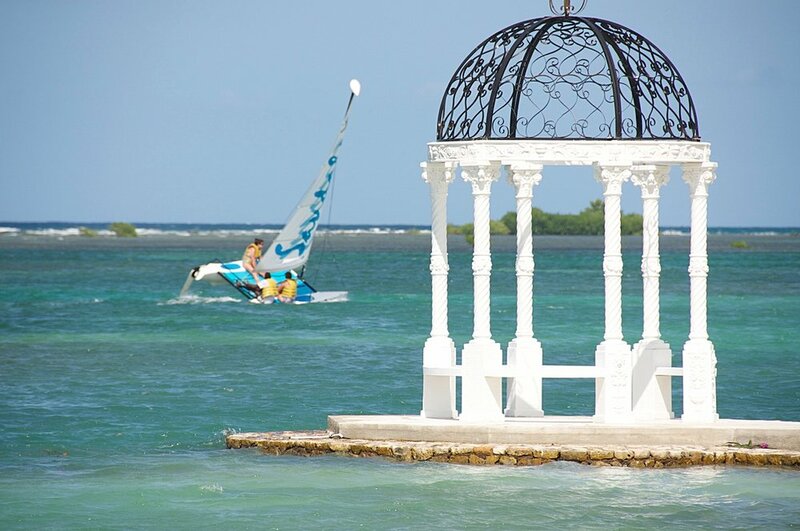 It is home to one of Sandals two private islands and only a few minute boat ride away from the resort. This island with a sensuous atmosphere found on the shores of Bali, Bora Bora, Moorea, or Tahiti complete with little hideaways to snuggle, and, of course, the “clothing optional” corner. The Wayang Doll dragon boat. travels back and forth throughout the day, ferrying guests to the island's a Tahitian styled swim-up pool, Jerk Shack, Royal Thai restaurant, and Red-Lane Spa. The island closes at 10:00 pm to guests of the main resort. The over-the-water private island butler villas and honeymoon bungalows can be reached from the private island, as long as you have security clearance. Yes, it is for guests of the villas and bungalows only. These guests can also reach their hideway in the Caribbean via private transfer which is always available to them. These guests share luxuries not found in Indonesia. The villas have a private plunge pool while all have over-the-water hammocks and swimming docks. It's not surprising when you hear that many of these couples are never seen to leave their intimate nests. My favorite restaurant is if French Le Jardinier. Sitting outside under the flower-filled trellis, it is the most romantic place to dine with the love of your life.